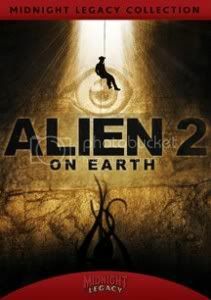 Alien 2 didn't make too much sense - the characters, the random excursions...well pretty much everything. That said, I actually enjoyed the film a lot. Maybe it was the anticipation, maybe it was a carbon monoxide leak in my house, who knows? The three things that really made this film a winner for me were the Splatter FX, the cinematography and the almost hallucinogenic/dream-like feel. Starting with the red stuff, Alien 2 delivers with some nasty exploding faces, decapitations and other gooey stuff. As far as the cinematography goes, surprisingly there are shots that are absolutely breath-taking (the best of which involves the shimmering lights of the cave explorers' headlamps as they descend into the cave). As far as the "feel" of the film, the whole thing just seems like one, long fever dream. The way the film was put together, most of the dialogue, the random shifting from one location to another, incomprehensible stops along the way...it just seems like a dream. Most people would say that this haphazard style is a negative but I thought it just made the film more unique. I doubt this was in any way intentional, but it worked for me. So if you still aren't convinced to check this film out, who can resist Aliens exploding out of people's faces? Midnight Legacy's treatment of their first release is incredible. I couldn't tell you a single film I have seen that is 31 years old and looks like it was filmed yesterday, other than Alien 2. My guess is that the film was so obscure that the print just wasn't played too many times, so it was still in pristine condition. I am behind the times so I watched this on DVD and the picture was positively stellar. From what I've read, the Blu Ray is superb as well. I am really anxious to see what this exciting new company has in store for its sophomore release.